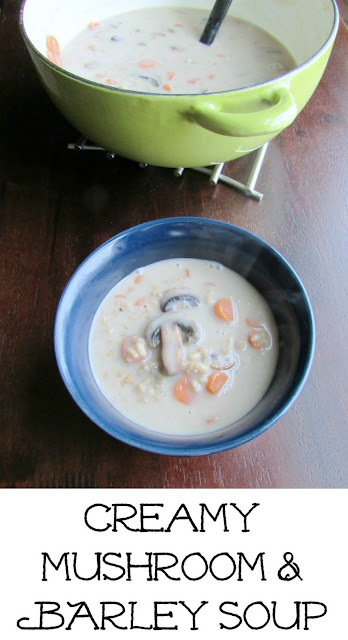 This Creamy Mushroom and Barley Soup is hearty, creamy and delicious. It is easily made vegetarian, but will satisfy everyone! It is a perfect cold weather lunch or dinner! A warm bowl full of creamy mushroom and barley soup is sure to warm you from the inside out. It is easy to make, creamy and comforting too. Grab a pot and get a spoon ready, you'll have a warm and tasty meal in no time. Is everyone else as done with winter as I am? I mean, I am really just over it. I am not a cold weather girl to start with. I don't really like bundling up and I really don't like how a cold wind can just cut through you. Don't get me wrong, sweating really isn't my jam either. But cold hurts and weather shouldn't hurt! Ok. I'm done with the pitty party. For now. Maybe. The one good thing that the cold weather brings is soup. A nice cold day just begs for a nice bowl of hot hearty soup. So I have a nice creamy soup for you today. It is full of mushrooms and barley and can be made completely vegetarian if you'd like. It is also hearty and delicious and you would never miss the meat if you aren't vegetarian but like to sneak in a meatless meal every once in a while. This soup really is full of flavor and has a nice creamy texture that you are going to love. The best part is I used milk and a little bit of cornstarch to give that creamy feel without all of the fat of using actual cream. It worked beautifully! 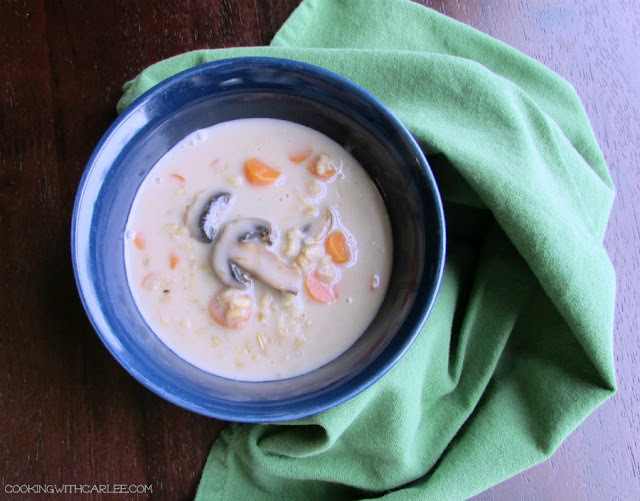 I am going to have to try that in a few of my other favorite creamy soups! What are your favorite soups to enjoy on a cold day? In your soup pot, heat the oil over medium heat. Add the onions and mushrooms and cook until the onions are translucent. Stir in the garlic and let it warm for a minute or two in the oil. Pour in your stock, being sure to deglaze anything left of the bottom of the pan. Bring to a low boil, then add the barley, bay leaf, thyme and salt and pepper. Drop to a simmer and let cook for about 30 minutes, stirring occasionally. In a large measuring cup or small bowl, stir together the milk and cornstarch. Pour into soup, while stirring. Allow the soup to come back up just to where it starts to bubble, stirring frequently. Adjust seasoning to taste and serve. Yep right now the only good thing about the cold is the rotation of soups!! 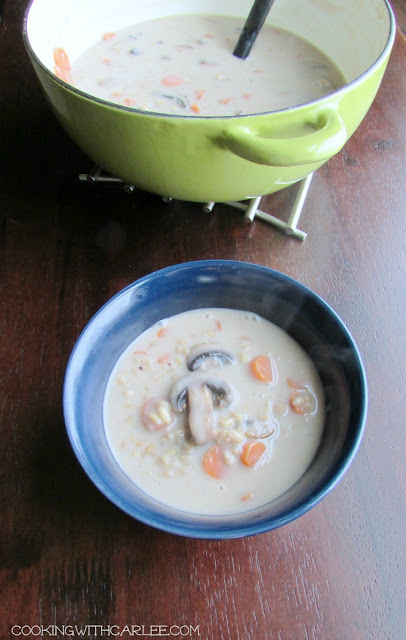 I love mushroom soup and this looks extra delish with the barley!! Have a great Wednesday girl!! Thanks, Andrea! The soups are good, but the weather is wearing on me! We are supposed to be in the 80s and then turn cold again. Ugh!!! I'm ready for sunshine and warmer mornings. Soup looks good though. We had 50s Monday and Tuesday, snow yesterday, 17 today and it's supposed to be 60 on Saturday. This kind of weather is hard to deal with!! I'm ready for spring too! I've been on such a mushroom kick lately, and this sounds great! We are all big mushroom fans at our house. Mmmm! Thank you! Hi Carlee, I'm with you on the cold, being cold makes me miserable. We've had a bad winter for us, and I am glad to report that there are signs that spring is not too far away. I love barley, I use half and half with brown rice and add it whenever I think it fits, like beef stew. Pinning this. Mmmm, beef stew with barley sounds great! We have had a relatively mild winter, but still cold and gray. We had snow and ice on Wednesday and it was nice enough to go play at the park today. The warm days give me hope, but following cold days are even a little harder to swallow! Your Soup looks amazing! Happy Valentine Day and thanks so much for sharing your awesome talent with us at Full Plate Thursday! So glad you share with us at Merry Monday. We always look forward to your yummy recipes.Can't wait to make your recipe! This post will be Featured at the new party this week! Pinned. This recipe is perfect for a cold day. Thanks for sharing your recipe on the Merry Monday Link Post.